The exhibition will intertwine the worlds of Escher and Nendo in a "masterful and enigmatic visual presentation"
Japanese design studio Nendo will create an immersive environment for more than 160 prints and drawings by Dutch artist MC Escher at the National Gallery of Victoria in Melbourne this December. Called Between Two Worlds | Escher X Nendo, the blockbuster exhibition will present MC Escher's prints and drawings, created between 1916 and 1969, inside an environment that plays with geometry, space and perception. Describing both Oki Sato, founder of Nendo, and Escher as "masters of illusion", the NGV said that the exhibition will intertwine the worlds of both artist and designer in a "masterful and enigmatic visual presentation". 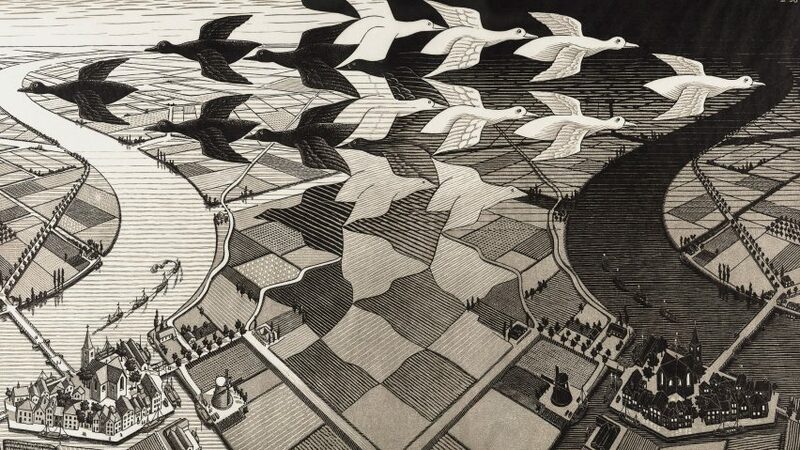 The 160 works by Escher, who is widely regarded as having created some of the most iconic images of the 20th-century, are drawn from the world's largest collection of the artist's work in the Gemeentemuseum in The Hague. The exhibition is the first major Australian presentation of the artist's work and will cover the full span of Escher's career, from 1916 through to his final work produced in 1969. Nendo meanwhile is no stranger to creating immersive environments. Last year the Tokyo studio scattered over 40,000 shards of polished steel across a Japanese flower-arranging school to create an "ivy of mirrors", and has created numerous imaginative retail environments such as a Tokyo store interior, which was designed to look like "melted ice cream cake". "What makes this exhibition particularly interesting is that as well as having these incredible 160 works on paper, is that we’ve actually invited a Japanese design team called Nendo to conceive the whole look and feel of the show," said Tony Ellwood, director of the NGV. "We've never done that before and in fact, Nendo's never done that before. The reason that we paired the two together is because both are really interested in innovation and optical illusion. There's a lot that connects them." Set to open in December, the blockbuster show will be the centrepiece of the National Gallery of Victoria's 2018/2019 season. Presented alongside the exclusive exhibition will be a programme of events, programs and exhibitions throughout spring and summer at NGV International and NGV Australia, including major solo exhibitions by Polly Borland, Julian Opie, Hito Steyerl and William Wegman.